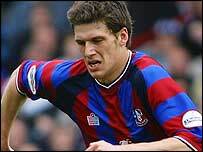 Premiership new-boys Crystal Palace have completed the signing of Fulham's Mark Hudson for an undisclosed fee. The 22-year-old defender spent 14 games on loan at Selhurst Park last season as Palace secured promotion to the top-flight via the play-offs. Hudson has worked with Eagles boss Iain Dowie before when he spent the start of last season on loan at Oldham. "The club would like to thank Mark for his services," said a statement on the Fulham club website.